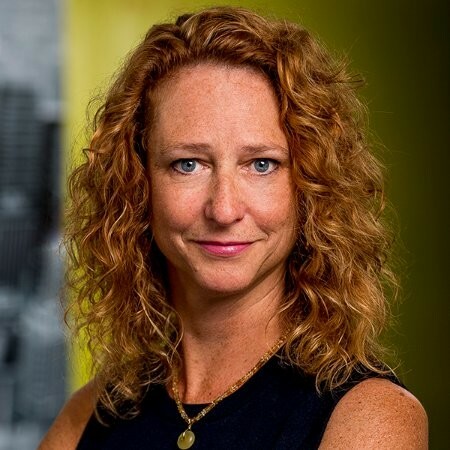 As leader of Showpad’s global marketing team, Theresa O’Neil is responsible for increasing awareness, generating leads, and supporting all channels to grow revenue. She has delivered marketing, sales and business development strategy for companies such as PowerReviews and IBM. Hey Teresa. Thanks so much for joining me. How are you doing today? I'm doing great, David. Thanks for having me. Yeah, I'm super excited to have you here. I'm super excited to have you on the podcast. I kind of want to get a lay of the land and learn a little bit more about what you guys are doing over at Showpad, so why don't you give us a brief rundown about what you're doing, who your customers are, and maybe what's different about you guys in the marketplace right now? Sure. I'd love to. And I guess where I always like to start is our vision, you know, this is how we see what's happening in the marketplace and our vision is that the best buyer experience wins. And I think we all know that from our own experiences. So we take that and our mission then is to empower sales and marketing to sell the way buyers want to buy. And we do that really in a couple of key areas. One is through smart sales content and the other one is through engaging buyer experiences. And what I mean by those is smart sales content for marketers it means that we can have the same insights at the bottom of the funnel as we have at the top of the funnel so that we can invest more in the content that impacts revenue. And then for the engaging buyer experience for sales, that means it's really easy for them to find present and share the right content at the right time with buyers, so enables them to get closer to guided selling or account based selling. And all of this is powered by data, analytics and artificial intelligence. So it's kind of going by our beyond our intuition as marketers and really giving us that data at the bottom of the funnel. That makes a ton of sense. And it's, the big hot word these days is segmentation, right? Like talking to your prospect, talking to your buyer the exact way that you need to. And it sounds like you guys have really dialed in on that exact concept. Yeah, absolutely. And what I love about is if we allow marketers to, you know, they can tag content for where it is in the funnel or the industry or the persona, any of those things that marketers will want to segment. And then that's complemented by the data analytics to show us what sales is actually using, you know, what our customers opening. And then most importantly, we integrate with the CRM on the back end so we can actually see what's tied to revenue. So it's not only the segmentation for execution, but in doing the analysis to see what works. Makes a ton of sense. I mean, it's a huge pain point. So I love the vision behind it. I love what you guys are trying to solve. Who do you guys take this to? Who are your customers, who you talk to. We're typically a B2B and whether it's a B2B sellers who are in person with their, with their buyers, so a lot of manufacturing, medical devices where they actually go in person to meet with their, with their buyers or increasingly it's digital sellers. People who are selling over the phone. Technology companies are, you know, an example of that. And really what we're seeing is like today, everybody has a digital seller, will you, whether you do most of your selling, you know, from your office or at the customer site, everybody engages in digital sellers. So we, we often start engaging first with the marketer because marketers are the ones who have the problem with sales isn't using the content I give them or no sales is creating like Frankenstein powerpoints or whatever those difficult pains are. And as a marketer mean if sales is doing that, it's because we're not delivering what they need. Right? So one of the things I love about Showpad, it really does help align marketing and sales and kind of bridges that gap. Makes a lot of sense. Yet I think you guys keep that brand, like you said, all encapsulated. So you guys can really control what that brand is because you want and I think the other big thing is getting that the data back and I think it's so critical because there was such a invisible kind of, you know, system happening at sales and it's just like, oh that's so awesome. Getting all that data back. Now. When did you actually join the Showpad team and maybe what was the company like? Customer size, team size at that time. And so I joined Showpad on Halloween in 2017 and the, the company size that we, we have over a thousand customers globally and we, you know, we've added a few hundred since that time. My team, so my team is based in Ghent in Belgium, which is where our headquarters is, Chicago which is our US headquarters. And then also San Francisco, which is another one of our US offices. We were about 10 people when I joined, we're about 20 now and we'll probably have 25 by the end of the year. Well that's awesome. That's great growth so fast. And what about when you joined, what were you first coming into? It was the pain point, like when you're coming and obviously they're bringing in someone to, to solve something. Yes, I, you know, and it's always hard to nail it down to one thing, right? But if I think about, you know, what, what I would totally like my priorities were when I, when I joined, one was around messaging, just having a clear way to talk about what we do. And the second is around data and helping clean up and put processes and technologies in place so we really could do a better job with attribution and analysis. And then the third one, which is, you know, a little bit of drink your own champagne, which is, you know, align sales and marketing both from a relationship point of view, but also, in terms of KPIs. Yeah, definitely the data seems like a lot of times, early stage you just don't have the systems in place to get all that data when you get to a certain size. Like, Oh man, we really need that data. So coming in and getting that stuff is there, you know, is there a unique challenge coming in at that time, having so much data it's already there and then trying to put systems in place. That should have been maybe from the beginning. Yeah, I think some of the challenges, you know, we had some technologies that work corrupting the data. So we had to get rid of those. That was a good start. But the other thing is we also, we redefined some key metrics like, you know, what is a marketing qualified lead and I think, you know, every organization needs to spend time on that, so it's a little harder to go back and measure apples to apples historically. So we're just doing a really good job now of trending our go forward now that we have those terms defined, agreed upon between sales and marketing and now we have the technology to have kind of one source of the truth. How would you define the marketing qualified lead? Is there something, a specific definition you give to it or you just saying like the actual values of that? Well, it was really a shift from going from, you know, lots of leads and overwhelming our, our bdrs to looking at people who really were ready to engage with us and had the highest propensity to convert into a meeting and to an opportunity. So for example, know downloading a piece of content, I download content all the time it doesn't necessarily mean I want to engage with that company. So that would not be a marketing qualified lead. Going to a booth would not be a marketing qualified lead, but having a conversation with the salesperson in the booth would. So it's really people who are putting up their hands, whether they're talking with us in our booth or they're actually seeing online, filling out a form to say, you know, I want a demo, I want pricing, I want to talk to sales. So just being more realistic about what is going to convert into a sales qualified lead. That makes a ton of sense. But I guess since your start, you know, where have you been able to really bring, you said before, eating your own cookie and bringing marketing and sales together when you guys are working with these larger companies, you know, what are you really learning when you're going in there? Was there a specific pain points that you found that you guys could bring your product into or, or you learn about how to create a better product? Yeah, I think one of the challenges that we see because we do work with a lot of global companies, is that, you know, there are certain practices with marketing and sales that might work when you're smaller so you can get feedback from sales, you know, what content is working and what content does not when you're smaller, but it's not scalable and certainly if you're a global organization is not scalable. You need that. You need that data based approach to, to that. I think the other thing with some of the larger companies is going beyond just the, you know, the content and the sharing and the presentation, which is all super important, but really helping them focus on what the buyer experiences like in providing a way for them to have really engaging conversations with their, with their prospects. So not just linear Powerpoints and you know, that that's hard because if the conversation veers off into a direction that you weren't expecting, it's kinda hard to reroute on a Powerpoint. So some of our solutions really allows a salesperson to do guided selling to navigate in the way that makes sense for that, for that customer or we had a new capability that came out just a couple months ago called shared spaces and I love that because it's a branded micro site so you can brand it with your buyers, you know, logo and their colors and then put all the content that is relevant for the opportunity in that space and everybody at the buyer's side who is involved can access it. So it's easy for the buyer and then the salesperson sees all of the data and statistics around who's opening things and sometimes you know, it helps them understand, you know, which of those stakeholders is actually actively engaged. So it helps them follow up. So I think it's both having those additional insights, but providing buyer experience that's going to differentiate them from the competition. And I think in the end, that's what excites me the most is we really are helping our customers differentiate themselves from their competitors. Absolutely. You're creating a personalized selling experience like never before. Did you have you guys seen anything just looking at maybe your own experiments or user experiments where you've seen any type of unique experiences like you said, where you're looking at the analytics of high touch people coming in or enterprise, you know, corporate people coming into the sales cycle that have really helped that sales process more? Some of the things that we've seen our customers are doing some really innovative things with, with our experiences in, one of the ones I can't even name the customer yet, but they are actually using the Showpad experience to bring in, you know, not only, you know, sales content and video and all the things you might expect, but pulling in realtime data from, from a number of other system. So it really becomes this portal for the sales person and it really has helped them engage kind of higher up the decision making stack. So, you know, those are the things that we love to see. No, that's incredible. Any specific data that they brought in that has been super helpful. I'm just trying to get any, any tips. Yeah, there's one that is super cool, but we're not ready to announce it yet, so you'll have to stay tuned for a future episode on that one. That's awesome. Yeah. We'll definitely have to link to the case study everything when you guys get out because that'll be super helpful for people, especially on this enterprise level selling cycle and so you're also at this, you know really unique level. You guys are getting to a great place where you're looking to become now a global organization. Now my question to you would be like, why now? Is there a specific time you think SaaS company should migrate from their market into a global market or expand out of there, you know, micro niche? Yeah. I think there's some things to consider about you know, how you want to grow your company because there are a lot of different ways that you can do it. You can go into different verticals, you can introduce new products or you can expand into different geographies. And I think for, you know, SaaS companies, what they really need to think about in each of those is, you know, what's the competition like, what's the market opportunity like in, you know, if your customers are enterprise in global customers, you're probably going to need some kind of global presence. So for Showpad, Showpad is actually based. We're based in Belgium and about half of our revenues are coming from Europe, the other half are in North America. So it's actually a great advantage for us to have that, you know, we've got that global DNA, as part of our kind of corporate energy. And so for us we do have global customers. It's important for us to be in multiple countries and there is market opportunity. So, the ability to expand in the US, which we've done. So I think we've added 40 people to our Chicago office since I joined, as well as opening new offices in Europe where the sales enablement space isn't quite as mature as, it' is in the US. So we just opened up an office in Munich and are getting a lot of buzz around that. So I think you just have to look at as every company does, where can I invest to get the best return on my investment? And I think the things I talked about just in looks at market opportunity and competition. If you have the opportunity to be the first one there, you know that that makes it a little sweeter. Is this more a marketing conversation or is this more like leadership, you have leadership coming in and say hey now is the right time to expand, or are you looking at it from a marketing opportunity and saying, listen, I think we've kind of saturated x market and it's time that we do something different with new product x, y, and Z. I always find this interesting conversation. When do you make those decisions to expand on one area? Or do you feel that you have more to give in that specific, let's say marketplace that you're in? Yes, so I mean it's certainly a leadership conversation with, you know, with marketing as part of leadership too, you know, to look at where the opportunities are and whether you can serve those markets, you know remotely and often you can up to a point, but if I, if I look at dock, which is you know, Germany, Switzerland, Austria area, because of language because they do have some different market trends that are, in topics that are different, it really made sense for us and because it is such a big market that has a lot of good fits with our ideal customer profiles, it made sense for us to put people in market rather than just trying to serve it from one of our other European offices. It makes a ton of sense. And I love that you also go back and really relate that back to your persona. I mean, you have to put it back to your persona and make sure that, you know, whatever efforts you do, whatever expansion you do fits back there. So what has been the biggest impact that you guys have seen for global effectiveness in your marketing? So I think it's in it's two parts. I would say, the first thing is in there, they're either complimentary or conflicting, right? Depending on how you look at them. So the first one is when we had our global company kickoff in February that the theme was one team, one dream, and we really wanted to bring together, you know, the European team and the US team, to have, to share that vision, to share that mission, to share all of the kind of company wide corporate KPIs and then for marketing, you know, looking at one set of priorities, one set of data, one set of processes just to not have to think about the infrastructure that we all have. So we share an infrastructure, we share programs like a global webinar program that we can reuse in all of our geographies. But then stepping back, complementing that with, you know, regional goals and budget and focus. And that takes into account like what's the stage of adoption of sales enablement in that geography. You know, what verticals, what (inaudible) should we be focusing on, what are the cost per leads and this varies a lot by country and we know that we have to invest more in, you know, for example the UK than we do in Belgium because the cost per lead is just different in those geographies and as long as we align with sales on those, those KPIs. So our alignment with sales is around MQLs, you know, using our waterfall, determine how many we need, but then pipeline and revenue because at the end of the day I can have the most beautiful website and the, you know, most wonderful messaging but if it doesn't help sales close deals, I'm not doing my job. So again, I think it was a combination of having a global approach, but making sure we're serving the regional needs of our teams. That makes a lot of sense. And I like that you guys go the, well, I mean it makes sense that you go from the approach of we're going to look at sales and when we reverse engineer from there kind of where is our biggest ROI and then it, you know, instead of looking at it like, hey, we're going to double down on our cheapest CPL, it doesn't matter if it's more expensive CPL as long as we're getting the return on the end. Right? Gotcha. Makes a ton of sense. And when you sit down with your team, are there specific marketing KPIs? Are quotas that you have in a regional area? Do they shift from area to area or is it really again, is that like a corporate, we want to have, you know, a thousand sales per month and then you guys can backtrack that from whatever region you want. But we just have one generic like sales goal that we're trying to hit. So every region has its goals. I mean because if you think about it, right, every salesperson has a quota and that rolls up into the, the region. And so we do have numbers, MQL, Pipeline and Revenue goals per region. And, and you know, so for demand generation, if I think about marketing, I put it in three buckets, so called it brand demand and when, so you know, brand is around awareness and thought leadership. So that might be like how many articles did we get in the press, you know, were we able to influence analysts, did our content get downloaded, what's our website traffic? So we have specific goals around awareness. Another thing would be like third party review sites like G2crowd, so setting specific goals, some of them global, some them regional, so like press relations would be regional around that branding awareness and thought leadership. The second bucket, which is the one that I think everyone thinks about is demand or demand generation. And again that comes back to MQL, Pipeline and Revenue by region and then more granularly looking at programs or campaigns and whatever the specific success metrics, whether they were, you know, attendees at an event or registering for a Webinar or a certain number of digital inbound leads. So having specific metrics around that. And then the third one when, which really I put anything that's going to help sales, customer success or partners, you know, grow revenue. And so that might be where we use our own tool to analyze our content, and its impact on revenue. It's helping streamline the product launch process. It's upsell campaigns. So those are the three buckets that I look at. Many of them have global metrics, but a lot of them have regional specific metrics. Makes a lot of sense. And I guess the one thing that I would wonder about is when you have three buckets and so much going on, how do you prioritize that? Do you personally have a system of which bucket gets the most attention and when? You know, that's just, you know, you obviously have a lot going on. There's a lot of campaigns happening at one time. I think it's two things. One, we focus on what we call messaging arcs. So looking at our, our product roadmap on, looking at our thought leadership map and just saying, okay, per quarter, you know, what is the theme that we're going to focus on to support the product roadmap, to support any ebooks we might be publishing and then that in turn feeds demand generation and social media and press relations and everything else. So I think first of all, even though all of these are fighting for priority and resource, to have an integrated approach to them I think is, is super helpful. And then within each of these, you know, my direct reports, they have to prioritize what they're working on and you know, whether it's stilling something or saying not yet. There are a lot of things certainly because, you know, I've been here what, seven months now, there are still things that I wish we could do, but I have to be practical. There's only a certain number of hours in the day. So some of the things we just put in the parking lot and we're not saying they're important, but there are other things that we have to do first and just be willing to acknowledge that you can't do everything as soon as you would like. Absolutely. That's the balance, the key balance that you have to figure out and so much of it is also patience and understanding and I think that's a big thing. You know, you want to do everything. And what would you say, looking back, not just in your seven months, but maybe just looking back over the growth of Showpad, what has been the biggest win for you guys? The biggest winner in marketing? I think the biggest win really has been realigning with our sales team and you know, having both that, that regional focus in the global approach and so, it's something that I think has helped us rollout better tools in our last couple of product launches and more awareness around them and then having the data to help us better manage the demand generation. So I do think it's that combination of, you know, global approach and regional focus. Staying aligned with sales and then the data to help show what's, what's working and what's not working. Any major lessons you'd give to people that are kind of getting into that stage or thinking about doing something in a, in a global shift, that you would give from lessons learned in the past seven months ago? No, I think it is to really step back and think about, you know, of all the things that you're doing because there was a lot of activity, right? So I think you want to shift your focus from activity to impact and you know, instead of doing three things, can you do one thing really well and it's, it's a hard habit to break. But what we have found, you know, for example, we were doing lots of regional webinars with, you know, not a ton of attendees and by focusing on a few global webinars, we've been able to, you know, improve the content, improve the promotions that we're doing for it and get, you know, tenfold the number of attendees. And in the end it's, it's less effort. So it's things like that about, you know, what can you, what activities can you stop doing in order to have a better effect and so anything that we can do globally, we will because it's a better use of our resource, but we also are really respectful to, you know, just the differences in the regions and the specific requirements they have for, you know, for MQL, Pipeline and Revenue. Totally. So a lot of data analysis it sounds like understanding those regions but also a key focus on focus and priority. And, and I think like you said before, like, you know, saying what can I stop doing, what can I delete is such a weird thing for us. We're so used to just throwing more on, doing more, but oftentimes doing the less is better because you can get better results. Sounds like you guys have definitely learned that lesson and been able to pull it off. Well, what I want to do now is I want to switch over to our lightening round questions. This is just a quick period is going through some quick questions. The first answer that comes to your mind, just throw back and it's a really fun little experiment here. Take a deep breath. I'm ready. Let's do it. Alright. Advice for early stage SaaS companies starting with marketing? Align with sales, align with sales, align with sales. Aline on your KPRs, and again, I recommend MQLs, Pipeline and Revenue. Align on who your ICP is. You're marketing to the people sales wants to, to sell to and then align the content and tools that they need and as you grow, maybe you'll need a tool like Showpad, but to start at least through conversation. So I think that that's my top advice, but don't forget the top of the funnel. You still have to do awareness and thought leadership. So that sales can get at bats, and then measure, iterate and improve. So, even though you do something well once you need to keep looking at it. That was an amazing answer. What marketing skill do you think is vital for marketing teams to improve and build on today? You know, I could say something like, you know, data and analytics, but I think everybody expects that. So what I, what I would say, so I am not saying you don't need it. You absolutely do. But I'd say really good cross functional collaboration, being able to influence people that you don't have any control over it because marketing deals with sales and product and customer success and everybody in the org and you need to be really good at that. And then, you know, project management, when I look at some of the projects that my team is working on, they're, they're complex, they have a lot of moving pieces and you know, any help you can give your team to make that easier I think would be great. Oh, I think Project management is an amazing answer. Something that so many people overlook, especially when you have all of those different things that you were talking about before. All the, all the initiatives going on. How do we do all this? So I think that's a great answer. What's the best educational resource you'd recommend for marketing? I really think it's your peers because I think about like if I'm going to look for new software or if I have a problem, the first thing I do is just reach out to my network or actually to my team. Those are the first two places I look. So just build your network. Don't be afraid to ask questions because I think everybody thinks they're behind and then I go talk with people and it's like actually we're doing pretty great. So don't be afraid to ask. Love that. Love that. Favorite marketing tool you can't live with. All right, so this is, this is not going to be my most exciting answer for all of this because it's really straightforward, but it's, it's, it's my marketing automation and CRM, Marketo and Salesforce, you know, there are a lot of other really great tools that, that my team uses. But you know, I think having a really good deployment of marketing automation and CRM is the foundation and everything else. You know, you build on top of it, but if you don't have that foundation, life's going to be hard. Absolutely. Yeah. I completely agree. I've never actually used Marketo, but I've heard nothing but great things, especially on this show. What about a brand, a business or team that you admire? So for this one, it's probably because it's top of mind. So it's an app called Insight Timer. It's a meditation app. It's got about 4 million users and in the last year or 18 months, they've switched their business model so that you use, it's free. It's, it was always free, but it used to be like highly curated and a new leader came on board and now there's tens of thousands of meditations and what they've done is they keep all the meditations and all the teachers are all free, but they are monetizing kind of convenient addons like being able to download the applications and I just admire them as a business because I think they're doing a good, really good job of, wanting to have this free resource to help us all be better meditators, which makes us, I believe the better people when we're, we're kind of off the off the cushion, but also like driving a business that's going to drive value. And I think, you know, those are just two things I admire and that, you know, I, I, I try to bring each day is like, you know, how can I help my colleagues and how can I help our business grow? Absolutely. I think, you know, what I'm pulling from that also is like how can I help add value to the world to right because they're adding so much value in their app already, so that's truly incredible. I have to check that app out and you know, just want to really genuinely say thank you so much for being on here today, sharing so much knowledge you, you really brought it today, so appreciate your energy. Appreciate your time and you know (inaudible). Thank you David it was a pleasure.